Today, one door closes and another one opens. It is my last day as kitchen overlord/gardener/chef at the preschool. I will be beginning a new job, also as a cook in another organic kitchen on Sunday. The day will be bittersweet. There has been much I've enjoyed over the past few years, and I will savor my my many fond memories. There are happy endings and great beginnings, and I'm looking forward to the new chapter in the Book of Bella. 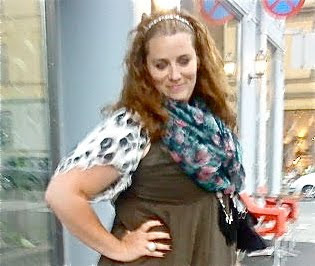 Anika, the fabulous Norwegian dynamo of style has featured me at Sweetfaced Style. She has unflagging energy and support for her fellow bloggers and is working on a series that features her faves from all over the world. I'm very honored to be featured in Anika's delightful blog. So if you get a moment, please step over to Sweetface Style and give Anika some love. And read her SWEET piece on me! Check it out at Sweet-faced Style. Good luck with this new job, and chapter in your life. I'm sure it will be full of new experiences. It'll be great to hear how it goes! Thank you for another totally wonderful comment - I always love reading yours! And I appreciate the blog award. Congrats, Bella, on the new job and the feature! I am sure you will be brilliant in your new job. And Your feature well diserved. You know by now that I adore your blog and youuuuuuuuuuu. thats true one closes another one opens! Are you going to participate in the competition??? Would be soooooooooo good. thank you all for your well wishes. it is a good life. and Sacramento: I am going to plan an outfit to submit that will be inspired by wonderful you! xo. Good luck and enjoy every minute of taking a new chapter in your life! Change is good, it's how we grow. Here's to happiness in the next chapter.